Not sure what’s more amazing here. I was in a Goodwill the other day looking through their selection of PC software. I’ve found some surprising gems this way, though it’s become less and less necessary with the advent of gog.com. Anyway, I didn’t find any software. I did find a SMAP album for 4 bucks, and I figured 4 bucks was worth it for an hour of Japanese boy band music. 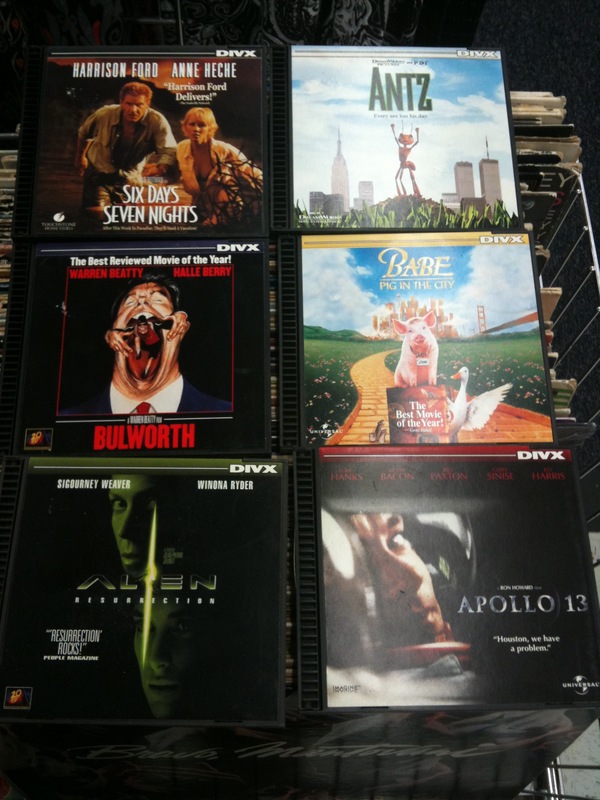 I also found these six DIVX movies. Now, this isn’t the Divx we all know and love; rather, they’re simply evidence of a brief dark period in history when Circuit City thought that they could make their own format of almost-DVDs. If you don’t remember, the shtick with DIVX was that you’d buy a disk for 3 or 4 bucks and then watch it once and then pay another 3 or 4 bucks the next time you wanted to watch it, which met with massive market rejection for so many reasons. I think a couple of companies have tried similar things since then, and they’ve also met with massive market rejection; they combine all the problems of physical media with all the annoyances of pay-per-view. Anyway, the system shut down back in 1998 or so, rendering all DIVX discs utterly useless, which brings me back to my original quandary – I’m not sure what’s more amazing here: That someone actually bought a DIVX player to begin with, that they bought this many movies, or that they actually took 13 years to get around to dumping them on Goodwill. They were five bucks each, by the way, which is pretty expensive as far as coasters go. I thought about buying one just for the novelty, but that’s a lot to pay for the privilege of owning a piece of utter failure. This entry was posted in movies & tv, random. Bookmark the permalink.